Stelioplast Kunststoffverarbeitung GmbH has been providing high quality plastic packaging made by extrusion blow-moulding to various different industries since 1970. Whether standard cannisters or custom designs, our competent team has been impressing customers with quality, service and know-how for over 40 years. We are innovation leaders in the field of COEX-truded containers and have developed this technology together with leading pesticide manufacturers. We are set up flexibly so that we can supply to all segments from multi-national companies through to small businesses. Flexibility, innovation and efficiency for the customer have priority in all areas of our business. We maintain a universally high standard of quality from concept through to delivery. We would be delighted to advise you on our products as well as the changing market developments and new packaging technologies. 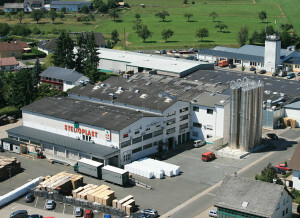 We offer you a reliable supply chain with our two production facilities in the centre of Germany and in the south of Germany.